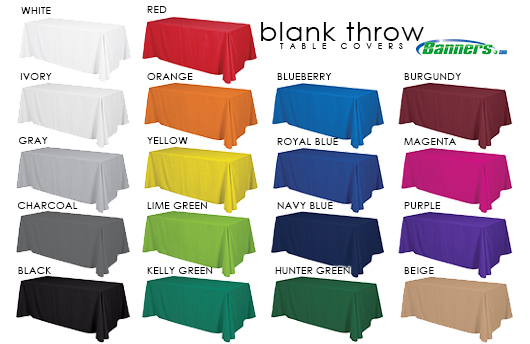 Blank throw table covers come in either a 6-foot size or an 8-foot size. They are available in a variety of different colors. Blank throws are printed on a poplin fabric. Blank Throws are available in: White, Ivory, Yellow, Red, Burgundy, Purple, Kelly Green, Blueberry, Royal Blue, Navy Blue, Hunter Green, Gray, Black, Charcoal Gray, Beige, Orange, Lime, and Magenta. Please note, colors on the computer screen may vary from the actual printed color. All blank throw table covers ship UPS. Please specify which shipping method you would like when you place your order or it will be shipping via UPS Ground. After products have shipped, all shipping company terms and conditions apply for lost or delayed packages. We will not refund the banner cost if UPS or any other shipping company has a delay in your package. We recommend ordering your blank throws early. All table covers must be paid for prior to being put into production. We accept Visa, MasterCard, American Express and Discover cards. We also accept checks. Checks must be received before your order is put into production. For more information on check orders, see our blog.